MylingSpel har nu dragit igång en kickstarter för sitt stora brädspelsprojekt Privateers!. Privateers! har testspelats runtom på svenska konvent under de senaste åren och nu är det dags att försöka sjösätta detta projekt på allvar. Privateers! är ett kooperativt / lag mot lag / solo piratäventyrs-brädspel på på en alternativ jord, som översvämmas av monster, magi, atlantiska lämningar, utomjordingar, demoner och de äldre gudarnas kultister. Spelarna tar på sig rollen av kaparkaptener med skepp och besättning. De bekämpar antingen varandra, eller spelet och dess mängder med skepp och övernaturliga allierade. Kaptener utforskare gamla ruiner, bekämpar fiendeskepp, anfaller och plundrar kolonier, bedriver handel, och har allmänt trevligt i Nya världens hamnar. Desto kraftfullare skepp, skickligare besättning och bättre utrustning de får, ju mäktigare blir de, men förr eller senare kommer de att tvingas möta det farligaste som fienden kan skicka mot dem! Privateers! is a cooperative / team / solo pirate adventure board game on an alternate Earth overrun by monsters, magic, Atlantean relics, aliens, demons and cultists of the Old Gods. Players control privateer captains with ship and crew. They fight each other, or the game with its numerous ships and supernatural allies. Captains explore old ruins, battle enemy ships, raid settlements, trade and generally have a good time in the port cities of the New World. The better ship, crew and equipment they get, the more powerful they become, but sooner or later they will have to face the best the enemy can muster! "I love the heavily thematic cooperative adventure games out on the market, but something was missing", said Tina Engström, the game?s designer. "I love the 17th and 18th centuries, old ships and the folklore of the time. And I really wanted to be able to play a cooperative game like that in a setting much like what you find in movies like Pirates of the Caribbean. Having many years of tabletop game development experience I figured I'd just make a game like that myself. After creating three roleplaying games in the same world, where two took place during the 17th century, it came almost natural to set it in this slightly absurd world of horror, conspiracy, hidden history, heroics and folklore. To get the right feel, the setting naturally had to be the New World during the Golden Age of Piracy." Myling Games is a small press game company with four years in the business. During that time they have published six roleplaying games with supplements, and have three more in the works for release within a year. Myling has run five successful crowdfunding campaigns before for different Swedish games and supplements. While earlier works have filled a few gaps in the Swedish market, Privateers! is designed for a much wider international audience. The campaign?s fundraising goal will allow Myling Games to professionally print the game and ship it to backers. The goal is set so that the campaign funds will cover the entire project cost with shipping, taxes, container customs, artwork, miniature sculpts and Kickstarter fees. This includes funding a fulfilment service, making shipping from within the United States, European Union and probably China, Australia and Canada possible, as well as ensuring a timely release of a high-quality game. The funding levels giving backers the core game, will also give an exclusive booster pack with a bunch of cool and strange bonus cards as a token of appreciation. 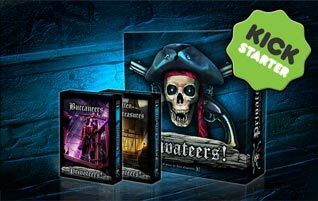 The higher funding levels will even give backers an extra booster pack focusing on the buccaneers of the 17th century, as well as the chance to contribute to the game in different ways. The tiers are setup to make it easy for international purchasers and groups to get the game, with free shipping to the largest markets and every price and cost displayed in multiple currencies. Check out Privateers! on Kickstarter.com! You might even find the board game you have been looking for. The Kickstarter campaign for Privateers! - The Board Game runs from October 23 to December 2, 2014 and can be found at http://kck.st/12jizEU. If you would like more information about Privateers! or the project, or to schedule an interview with Tina or Jörgen please email info@mylingspel.se or send us a Tweet @MylingGames.